Hate it. Don't like the boy-ish hair, don't like too many models, don't like the studio-ness of it all. Next. They're going to sell fish in the market. franceslions, [Piece Of Me] and YohjiAddict like this. With such a fresh runway presentation this falls flat! Really boring and soulless. The casting is really insipid and the fact they used so many people is kind of absurd. I guess they thought the concept was so weak they had to go overboard for the casting. franceslions, YohjiAddict, TheoG and 1 other person like this. franceslions and TheoG like this. Too many girls in one picture. Awful hair and make up and boring background (same as last season). What's happening? Very pleased to see Kris, Nora and the beautiful Sarah Dahl though. Benn98 and LustforFashion like this. franceslions, mikel, Your Anchor and 2 others like this. As bad as the headbanded Beckhams on UK Vogue. Do people not learn? It's very bad, i don't get it why they have a "cholo gang" look. One of the worst campaigns on the S/S season. Should have just been Kris. But that kind of campaign ain’t gonna happen anymore....EVERYTHING must be multi-MULTI-girl these days to make sure every race is represented at all times. OR ELSE. What bothers me about this - aside from everything becoming monotonous, is that it ends up feeling like a consolation to make sure no one is offended, rather than making any kind of creative choice. tigerrouge, Frida, Creative and 2 others like this. Why is Luna not part of this??? franceslions, HeatherAnne and LiquidDiamond like this. OKAY. This dull and lifeless campaign would have been good if AT LEAST it had an impressive cast. 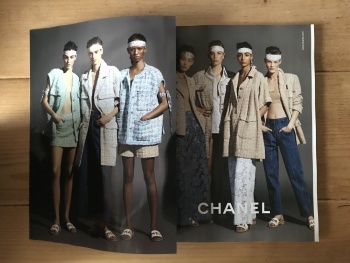 Adesuwa is NOT a Chanel girl. She's too gothic and ghetto-looking for the elegance of the brand. She's better off with Alexander Wang or St. Laurent (I would prefer Adut or Imaan in her place). Same goes to Sara Dahl, i mean, why is she even there? She looks so random. If you want to add another white girl at least pick the one who fits the brand like Lauren de Graaf perhaps? She's been a Chanel runway staple and exclusive for years and still hasn't have her well-deserve campaign. Kris Grikaite is average but somehow fits the brand just fine. HyunJi Shin looks too young for the brand just like Yoon Young Bae last season. I think the only Asian girl who was a total fit for the brand aside from Devon Aoki is Hoyeon Jung who appeared in last season's campaign. Nora Attal? SERIOUSLY? She LITERALLY looks exactly the same in all of her photos. Rebecca Logendyke and Vitorria Ceretti are the only ones who are saving this godawful campaign. Where's Luna Bijl, Grace Elizabeth and Nina Marker when you need them? 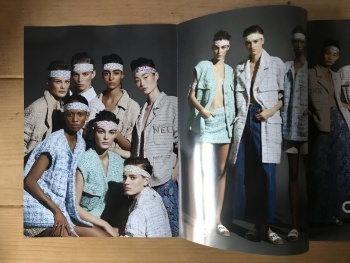 Furthermore, with this collection, the campaign would have been shot much better in the OUTDOORS like on a seaside cliff maybe? or in an elegant and luxurious parisian inland resort. Karl is getting lazy I see. franceslions and LiquidDiamond like this. I don't like the images and feel like there are too many girls, but I'm happy to see Rebecca land a major campaign. There's that Adesuwa girl again....how she books anything is beyond me. This campaign is as unimaginative as last season. For summer?? Since studio settings are the norm in fashion photography now, at least try to cook up something unique. The lighting is awful, composition is off, and Carine clearly saves the best for Max Mara. Terrible campaign. franceslions and xandroh like this. Why are there so many girls in this campaign? Did they just book everyone who went to the casting? No offence but a Chanel campaign is meant to be a reaaaaally big deal for a models career and most of these girls don't have that star quality. I don't even know why they bother advertising when they put so little effort into it every single season. There are way too many girls here and they don't carry the campaign. It's not that they look bad but there's nothing very special here. Imagine if the cast was along the lines of Luna, Adut, and Rianne. This would have been 10x better. Dire. No more, no less.